Academic-Capital: Leonardo di Vinci’s Lost Painting "Medusa’s Shield"
Leonardo di Vinci’s Lost Painting "Medusa’s Shield"
Medusa’s Shield has been lost in time but is one of those mysterious Leonardo da Vinci works with a high level of spirit and debate. Originally painted in his youth an art historian Giorgio Vasari made the account in 1550 that the painting was so realistic it frightened both Leonardo’s father as well as others. It was seen as associated with death and was secretly sold to merchants. Vasari indicates that the face was painted on a wooden shield cut from fig trees. It was a favor to a peasant friend of his who fashioned the shield. Leonardo in his experimental style took the shield and heated it by fire and made it smooth. He then moved to make one his very first masterpieces. It is believed that the painting made its way to the Duke of Milan who held it for a while and then sold it again for 3X what he paid for it. Medusa was part of Greek Mythology. She was seen as a protector who was sexually forced by Poseidon and in Athena’s rage she took the “fair cheeked Medusa” and turned her hair into snakes and her skin into scales so that all men would hate her. Her very look would turn a man to stone. To historians and lay people Medusa represents many different things. To some she is an example of female rage and the victim of lust and jealousy. To Freud it was a sense of castration while to others it means scientific determinism. Scientific determinism indicates that under the exact same conditions the same thing would happen again and again. 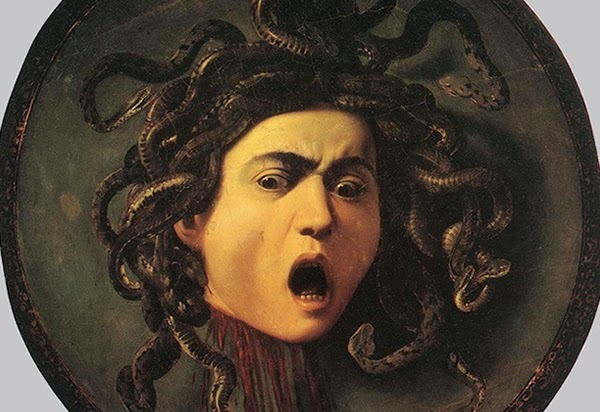 Regardless of the interpretations, Medusa is an interesting character to both Leonardo and the world as it took Perseus’s wit to eventually behead her making it an important story of history.